Grow your own food all year round in smaller spaces and colder climates. With SunCatcher, a few square feet of south-facing space is all you need to sustainably grow your own food year round for the next two decades. 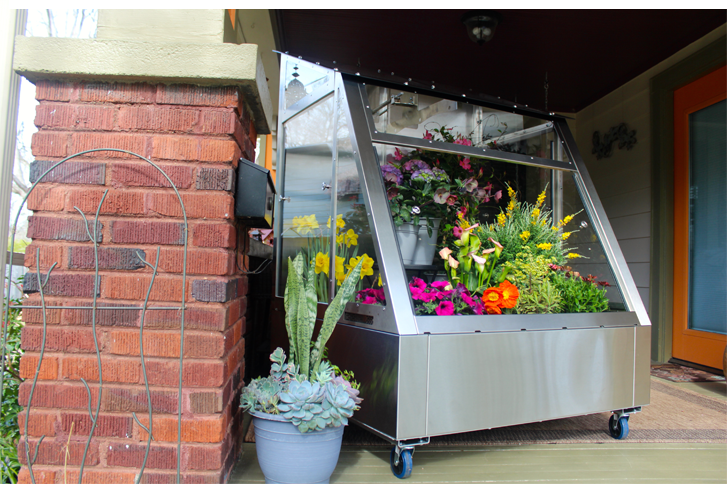 Our patented design distills over forty years of high-end passive solar engineering and science into a compact, common sense, superior greenhouse tailored to suit smaller spaces. You want to grow your own food, but you don’t have room for a garden, community spaces are inconvenient, and your porch is too cold in the winter. For the first time, we have utilized decades of farm-scale, patented passive solar greenhouse science and engineering into a portable, energy efficient solution that is perfect for you: SunCatcher. Shipped to your home and easily assembled on your porch or other small outdoor space, your SunCatcher provides a personalized, beautiful, year round space for growing. Skip the hassles and heating needs of lesser products and invest in a grow space that will save money and produce for years to come. Our family owned, western North Carolina greenhouse business has been helping local growers and communities grow all year round with our passive solar powered greenhouse designs. Time and again, we have had local folks ask for a smaller model that better fits into a more urban lifestyle, with a better price point. Partnering with Bowen, another family owned WNC manufacturer, we have finally made just the thing: the SunCatcher.